On Monday of this week, we were hired to perform DIT and editing duties on a very special recording session at Abbey Road Studios, marking the 50th anniversary of the famous 12-hour session that resulted in The Beatles’ debut album Please Please Me. That’s right – a 12-hour session in 1963, produced by George Martin, during which the band recorded 11 songs that featured on the finished album. The fact that most bands struggle to record an album in a year these days is a testament to what was achieved that day in Studio 2 at Abbey Road. That it also launched the band that changed the history of music is even more remarkable. All in 12 hours. To mark this special day, BBC Radio 2 were attempting to re-enact that famous session, with a house band and 11 special guests, all in the same timescale, with a subsequent documentary about the day due to air on Friday 15th February on BBC4. I was hired to edit the music performances for that show, with my assistant Darren Martin performing on-set DIT duties. My challenge was to edit rough cuts of as many tracks as possible on the day, and finish all 11 edits by the end of the following day, so that the programme would be ready to assemble and grade for broadcast on the Friday. We’ve worked to some pretty gruelling schedules in the past, most notably on the Paul Weller show from Abbey Road, but cutting 11 songs in two days was a new challenge. The first technical decision we had to make was what tools we would use to complete the job. I was informed by Producer Phil Critchlow of TBI Media that the show was to be compiled on FCP 7 in a leading post house in Soho. Ideally we would be expected to work using the same system. This was the first hurdle. To edit Canon C300 rushes on FCP 7 would involve transcoding to Pro Res. With 11 tracks to cut in such a short space of time, this wasn’t an option. The only way we could work to this timeframe was to use Adobe Premiere CS6, which allows editors to work with camera native files immediately. These edits, once approved, would then be exported to Pro Res to drop in to the main edit on FCP 7, meaning that I could begin editing straight away on set. Instead of waiting around for rushes to transcode, with Premiere I was up and running, cutting 5-stream multicamera performances in the corner of Studio 2, as the bands were performing. With me working away on the HP Z820 workstation, Darren was beside me on the HP Z1, feeding me rushes as they came off the cameras’ CF cards via Shot Put Pro. With 5 cameras recording 11 songs, that was a considerable amount of media to deal with – a major task in itself to get backed up 3 times on set in such a short space of time. The role of a DIT is really a thankless task, left behind transferring rushes at the end of the day, whilst everyone else is having a pint. But a good DIT is worth their weight in gold, and Darren’s attention to detail paid off on this shoot – none of my time was wasted looking for rushes, meaning I was able to focus on the job at hand. Darren was rewarded for all his hard work when his Mum texted him to let him know she spotted him on a report featured on the One Show that night! 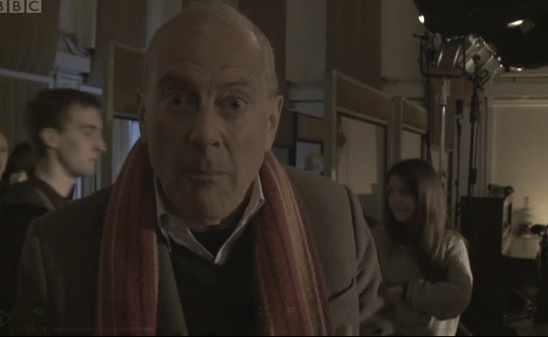 Darren, to the left of Gyles Brandreth, on The One Show. He doesn’t always walk with his eyes shut. With the first performance in the can, it was a half hour wait while the 5 cards were transferred and backed-up 3 times. Within an hour the initial cut of the first track was complete, and had been viewed by the director and producer, with just a couple of changes to make once in the edit suite the following day. The rest of the day proceeded in a similar fashion and ended with me completing 8 of the 11 first cuts on set, with just another 3 to complete the following day. After a night in one of the worst hotels in London, on Tuesday morning we transported our machines to the post house in Soho, and effectively built our own edit suite on the premises, as they were not running Premiere in any of their 14 suites. Hopefully with the growing demise of FCP 7 and with people realising the capabilities of CS6, more and more post houses will start adopting Premiere as the natural successor to their out of date FCP 7 suites. As stated above, for me it was the only possible tool to use for this job, and I would have preferred a complete Premiere workflow from start to finish, including the documentary edit. With the suite built, I spent the morning cutting the final 3 tracks, and the remainder of the day fine tuning all 11 edits with director Matthew Amos, before calling it a day at 10pm. The brilliant Beverley Knight performing Twist & Shout. At the time of writing this blog, I haven’t seen the finished show, so have no idea how it has all come together as a documentary. Of the music performances, the highlights for me were Gabrielle Aplin, Stereophonics, I Am Kloot, Graham Coxon and Joss Stone. 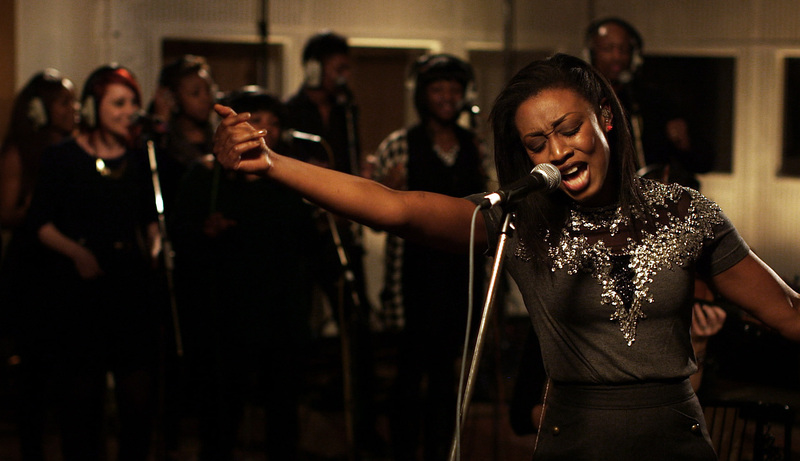 But the absolute standout was Beverley Knight performing Twist & Shout with a gospel choir, who almost raised the roof off that old famous studio with the energy of their performance. A fitting way to end that 12-hour session and bring to a close an amazing day.